For Extremists In Syria, Extortion Brings Piles Of Cash From Iraq : Parallels Radical rebel groups in Syria and Iraq have gained the upper hand over moderates with Mafia-style protection rackets that force ordinary Iraqis to hand over millions across the border. This undated image posted on a militant website in January shows fighters from the al-Qaida linked Islamic State of Iraq and Syria, or ISIS, marching in Raqqa, Syria. The renegade Islamist group known as ISIS now controls swaths of Syria and Iraq, and it's partly because the fighters are so rich. 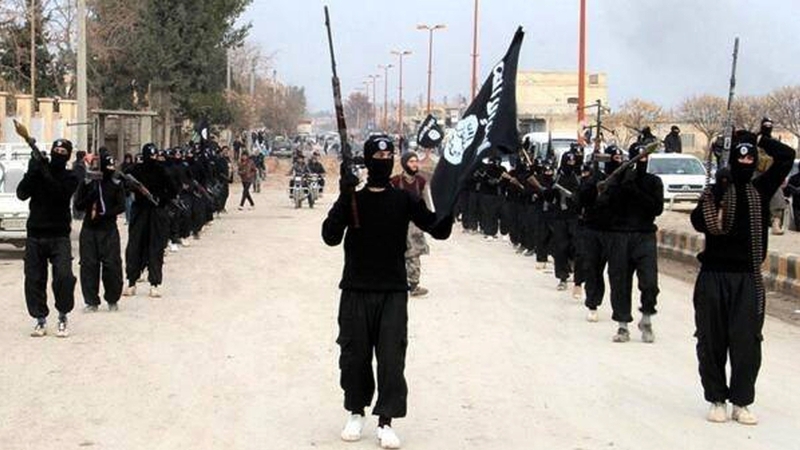 ISIS, or the Islamic State of Iraq and Syria, is known for having the biggest guns and paying the highest salaries. While kidnapping, oil smuggling and donations from sympathizers have been well-known sources of money, the groups also run complex and brutal protection rackets, according to analysts. Charles Lister of the Brookings Institution in Doha, Qatar, says Iraqi intelligence sources estimate that extremist militants take in more than $1 million a month in extortion from the northern Iraqi city of Mosul. 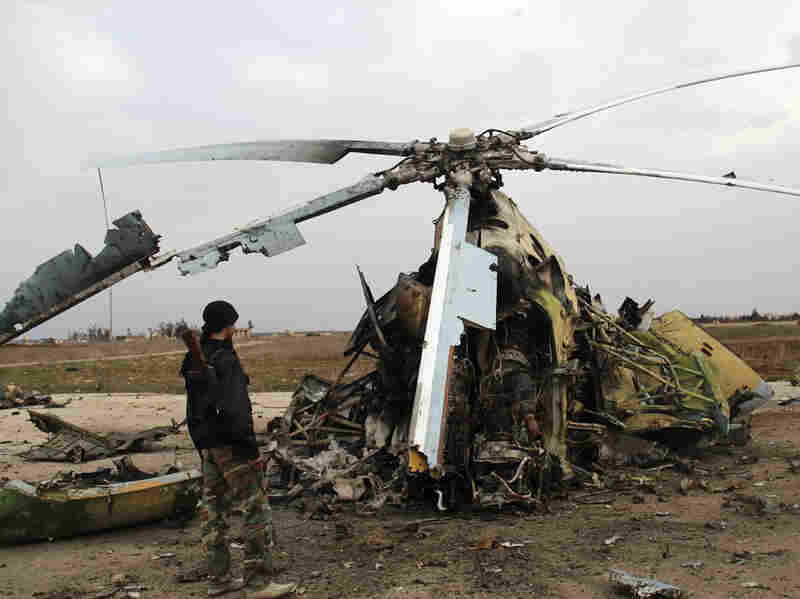 Rebel fighters inspect the wreckage of a Syrian army helicopter after the Islamic State of Iraq and Syria, or ISIS, allegedly destroyed it in March in the northern Syrian city of Aleppo. "Mosul seems to have acquired a very central role in terms of making money," Lister says. "Certainly since late 2012, early 2013, I've seen a number of reports to suggest that ISIS's activities in extortion and acquiring levies on transport and real estate having increased fairly dramatically." Money has been important in helping extremist militants in Syria overtake more moderate and Western-backed rebels fighting against the Syrian government. In Mosul, the extortionists prey on thousands with regular demands and threats. The story of one small business owner shows how it works. Tawfik ran a computer shop in Mosul until last year. He was too afraid to give his full name even though he has fled Mosul for the safer city of Erbil. He says he left Mosul after an anonymous caller demanded about $114,000 for jihad, or holy war, an unthinkable amount for a shop owner who made perhaps $1,000 a month. The extortionists "told us that everyone in the street who is working pays for them and that we should pay too," Tawfik says. "They killed three people because they had not paid or were actually late to pay. They were really serious." He didn't know who the men were — they told him to leave the money for them in a bag. "Those kinds of guys are like ghosts," he says. "You can't see them. You pay them but you cannot see them. You don't know who they are and where they live. You have no idea about them. They stay in the shadows and they take the money." Several other people interviewed said the problem of extortion is entrenched and ongoing. Abulraheem al Shammari, an official at the Mosul provincial council, says the phenomenon is crippling the city. "They are extorting money from tradesmen, people with capital, shops, and pharmacy owners," he says. "I believe that all the state officials are aware of it." And he agrees with residents who say the police and army, despite a heavy presence in the city, are powerless against this heavily armed mafia. "I don't believe that a plan to tackle the issue exists," he says. Alice Fordham is NPR's Beirut correspondent. Follow her @AliceFordham.